I’d heard some good things about Mavala’s mascara, so the next time I was going by a Sasa store, I popped in and picked one up in Black. It comes in a rather large bottle, with a slim long silver cap. For now I’ve only ever seen it at Sasa stores. What I liked first off about this mascara is its brush. Its a curved brush but I’m a novice with mascara, so I wasn’t quite sure how to use it. That’s not what I like about it. What I like is that the brush head is small and bristles on the brush are very small. I have sparse, short lashes, so this was great for me, as it could grab onto each lash to coat it with the mascara. Its supposed to be enriched with protein to help protect your lashes from breaking. I found that it did make my lashes look longer and enhanced my eyes. However, the bad news is that despite its claims of being waterproof, it smudged on me. I don’t quite understand why it smudged. I did not get my eyes wet at all the whole day, yet towards the end of the day, I found that the bottom lid was dark. As the mascara is the only new thing I’ve added into my routine, it had to be it. I even tested it on a few days just to be sure, but after my colleague repeatedly warned me of my mascara running and of me looking like a panda, I’ve given up on it. However, whatever is left on my lashes can be hard to remove with my eye makeup remover. So its a bit of a contradiction there. 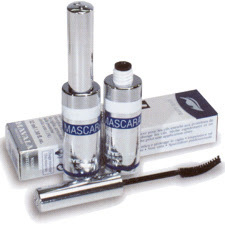 Mavala mascaras retail for about RM27 or so at Sasa stores. 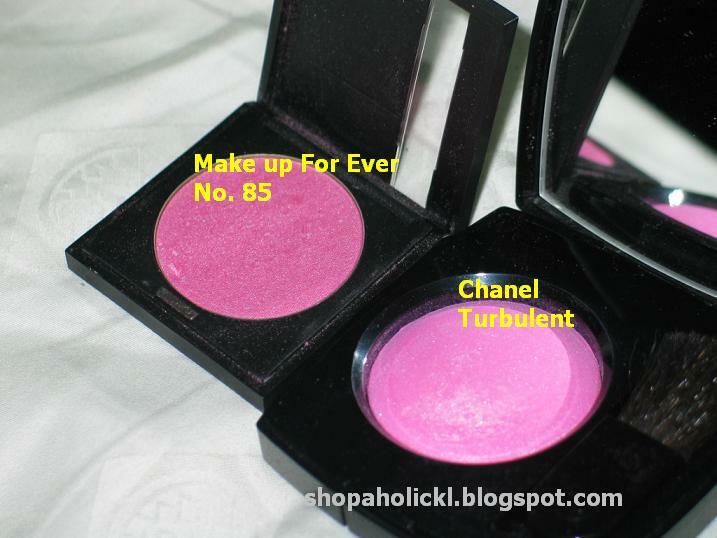 They have lots of colours available, if you like colour on your lashes. So far, only Lancome Flextencils is working best for me! I was introduced to this liquid foundation during a makeover at Kanebo. Revue is one of Kanebo’s department store brands like T’estimo and over here, can be found at the same counter i.e. the Kanebo counter. Revue specialises in base products i.e. for your face – primers, foundations, powders etc. 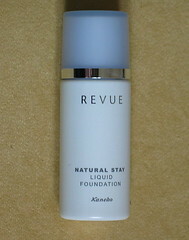 This packaging is actually the older packaging for the Revue Natural Stay Liquid Foundation. The new packaging is a pink bottle that looks quite adorable. The texture is that of a watery liquid. 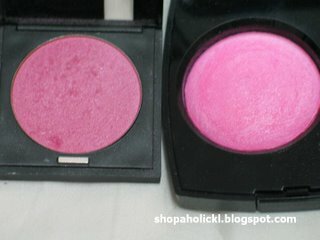 You must shake it before applying so the colour is mixed up evenly. 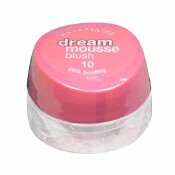 I like the liquid texture as it does not feel thick when you apply it on, like normal foundations. The texture however, is on the sheer side, so those who need more coverage might prefer something else. If you are like me (I don’t have perfect skin) and don’t like the feeling of a thick heavy foundation, you’ll like this one. 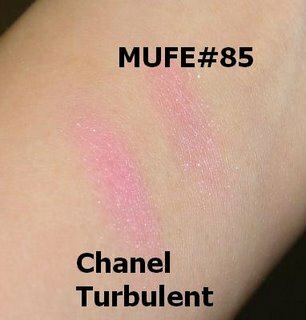 It sinks into your skin nicely and you don’t even feel like you are wearing foundation at all. I usually dust some loose powder over it, just to set it, and I’m good to go. The nice thing about it being on the sheer side is that even if you make a mistake and don’t apply it smoothly, it won’t show up. The downside of course is that it doesn’t cover blemishes very well. But that’s what concealer is for, right? The bottle is a little 30ml bottle which is very little, but you only use very little anyway since its so liquid. It spreads very easily which again is nice. I use my fingers to apply, but you can use a sponge. It costs about RM129 which is expensive considering.